I had a grand idea. It was to get Hubby and our kids, Hubby’s brothers, their wives and their kids all together for a photo shoot. 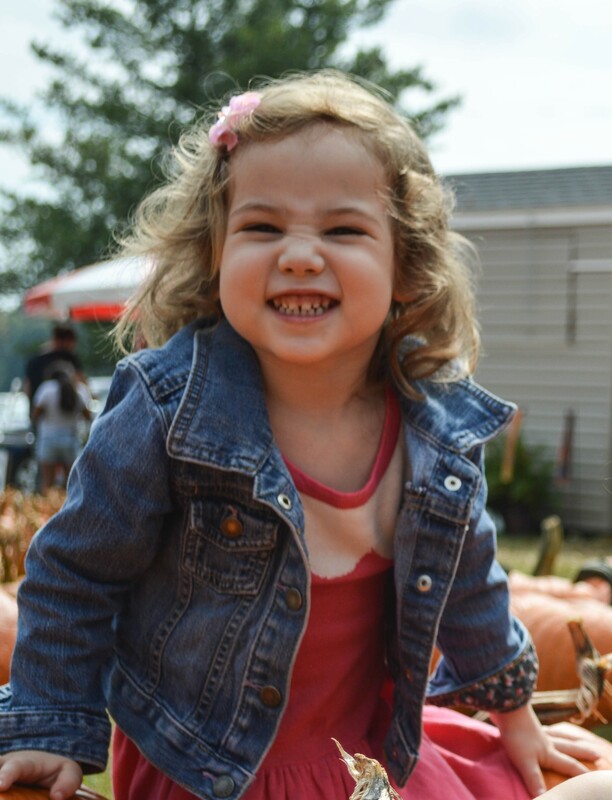 It’s fall, so we figured a local pumpkin patch was the best place to do it. We planned our outfits, picked a time that worked around everyone’s naps, and planned our weekend around it. J can sometimes have a super long morning nap, so I ended up having to wake him up to get him ready to go. I was a little worried whether or not he’d let go of me and hang out with the other kids so we could get some good pictures. Little did I know, he wasn’t the one I needed to worry about. EK had had a totally normal morning, and right when we got to the pumpkin patch, she was really sweet on all the littler babies. But then, we decided we wanted to put the babies in a wagon (this place had those red Radio Flyers you could put the pumpkins in to take them to the car) and have EK pull it. But it was tougher than it looked (when it was full of pumpkins and babies), so I tried to help her a little. Note: She didn’t want the help. Cue the biggest “terrible two” meltdown I’ve ever seen. This was a lay-on-the-ground, scream-at-the-top-of-her-lungs sort of tantrum. My even-tempered child turned into an angry monster over whom I had no control. No one could do anything, so we all stood around, a little nervously, and try to pretend no one noticed the tantruming toddler. Hubby’s mom finally picked her up and took her to get a snow cone from the stand nearby (because it’s okay when grandmas do that) so that we could try to continue taking photos. But as soon as snow cone time was over, it was meltdown #2. Or maybe the meltdown had only paused. Either way, the cute photos of my daughter were pretty much over. What does a mama do in that situation? Wait it out. In a public place, surrounded by family and strangers alike, I just had to let it run its course. Thankfully, everyone was gracious and turned a blind eye to the ground-shaking sounds erupting from the small body. It was her first real tantrum, and we haven’t had another one since. Here’s to praying that it was a one-time fluke… right? The mischievous face of my darling daughter, pre-meltdown. I think she was plotting all along.